Here's what I've been up to. After a short break from September's 30 paintings in 30 days project, I took up another 30x30 marathon, this time with a show at a local art gallery at the finish line. I continued my theme of flowers on Yupo and refined my process to a point where I became very comfortable with it. I feel like the next step should be growing these florals larger and abstract-er. Maybe sometime soon. Closeup of a watercolor on Yupo in progress. Working on this many panels in a short time created some logistical challenges. This last move left me without a studio and I get to be all kinds of creative around the dining room and living area. So, these ledge shelves from Crate & Barrel were my solution to the drying and storage issues. Well, not so much drying, since I usually keep watercolors on Yupo flat until they are dry, but these shelves do keep them all nice and away from forces of nature (like my kids). I got six of these, three on each side of my dining room window. Another curious part of this project was mounting it on a 41x41" board (the gallery's idea). I wasn't so sure about it at first but loved how it turned out. If nothing sells, I will welcome the whole panel back with joy. It is beautiful. The show runs through Jan. 9, 2016 at Blue Line Arts Gallery (405 Vernon Street, Suite 100 Roseville, CA). Reception is on December 19, 7-9 pm. 30 Paintings in 30 Days, here we go! I've been waiting to announce my participation in the 30 Paintings in 30 Day challenge until the last moment. These days, I can't plan things very far in advance, at least not without running a high risk of getting frustrated and disappointed. So. It starts tomorrow, and tomorrow I plan on posting painting number one :) . After that, we'll see what happens. I'm going to scratch the weekends off and shoot for 20 paintings. One month, 20 paintings. I'd be happy with that. Let's see...Elijah was 3, Katia was 8 months old and I was pregnant with Ella. Fun times. "What was I thinking?" Yep, that's what I'm thinking. Challenge 2. September of the same year (2013). I had a tentative landscape theme. Ella was born in early November. For the third challenge, I kept things relatively low key. Two months after I had a baby and all that. This is how I keep myself (relatively) sane. I skipped two challenges (September 2014 and January 2015). I just had no mojo. Or FOMO. Maybe a little bit of the latter, but really, not enough. My mind is already busy burying most of 2014 away from accessible memory. It sucked. And so, gingerly, I am doing a 30-in-30 challenge again. Bring it on. I decided to go with a theme this time, and the theme shall be bold and colorful flowers. Somehow, the fact that I paint a lot of flowers escaped me. It probably has something to do with me wanting to be a serious and important artist, not some tree-hugging, flower-smelling stay-at-home mom who paints watercolors for fun. Serious art is not fun. Are you going to California State Fair? ...to the tune of "Scarborough Fair," of course! I am going, and I will be painting live as part of the Plein Air at the Fair competition. I thought, "Why not?" I like getting outside and painting or sketching, and there's going to be a ton of subject matter at the fair, and it only costs me $10 to enter a painting (I signed up for three), so why not? I plan on being there on July 18 and 19, around 11 am - 6pm. Maybe later. If you're around and you want to come say hi, let me know ASAP. As a small token of appreciation, here's a free shipping code for anything you want on my website: JUST4YOU (enter at checkout, ends 12/03). Please join me at the reception for the 20/20 show at the Kennedy Art Gallery! This annual show features artwork submitted by Sacramento artists and reviewed by a professional panel of judges. Each artist created 25 pieces which conform to an 8” x 8” format, all in a selected theme. The most popular annual event at Kennedy Gallery, this year’ 20/20 showcases over 750 pieces of art from 30 finalists! I chose a very special to me theme for this project: Ukrainian cities and landmarks. As someone who was born and grew up in Ukraine, I have been deeply affected by the unfolding events in the country over the last several months. These 25+ paintings that I created for the show reflect my relationship with my homeland, my memories and my feelings while also highlighting the best of Ukrainian architecture. I hope you will enjoy them. Kennedy Gallery, voted Sacramento’s Favorite on KCRA’s A-List and by Sacramento News & Review, is located at the corner of 20th and L Streets in the heart of Midtown Sacramento’s Art Walk. Well, Hello from the State Capital! I cannot believe it's been over a month since my last blog post. Since we found out that my husband got the job in Sacramento and we decided to move, it was like someone pressed the "forward" button. Things moved fast. Curiouser and Curiouser. 30x22" watercolor on paper. ...which was cool. This is my first award at a show that may mean anything (vs my ribbons from the San Bernardino County Fair, where I felt I had no competition to speak of). I feel good about it :) The show will run April 1 though April 19 with a 2nd Saturday (Sacramento's monthly art walk) reception on April 12 5:30 - 8:30 pm. Location is the Sacramento Fine Arts Center. You are invited! Unfortunately, this also means that all the classes and happenings I had planned in the High Desert will not happen and somebody else will need to take over my High Desert Art Meetup group. It's bittersweet. I am hoping that I will be able to focus instead on developing the long-promised online courses, a regular plein air and figure drawing routine, and a solid body of work. I feel that this move is a step up. You are invited to Art & Wine Lake Arrowhead! Please come and enjoy this exclusive event with me and an excellent selection of other Southern California artists! The festival features painters, photographers, glass and ceramic artists, wood artists and more. There will be live music, food, and of course, wine! I plan on entertaining my booth visitors by painting demos and will be offering on-the-spot portrait paintings. For map, parking directions, and other information, please visit the Art & Wine website. To reach Tavern Bay, take Highway 18 to the Lake Arrowhead turn-off. At the 4-way stop sign, continue straight along 173 past the lake until you see the UCLA Conference Center sign where you turn left (Willow Creek Road), which takes you to the lake. The entrance to the festival is on the right around the conference center, at the first left gate. Guess who's in the paper! In April, I visited an art club in Phelan, CA, spoke a bit about myself and my art and did a watercolor painting demo of a little girl. It was a pleasant visit! I am often amazed at and very grateful to people who show interest in my art, and even more when they are willing to spend hours watching me paint. 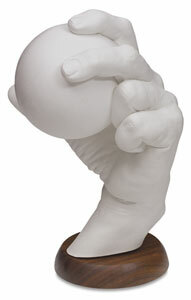 And, of course, my collectors, who spend their hard-earned money on a piece of art that I created. It's humbling. Yep, just like that, we're expecting. Totally unexpectedly and against all odds (may the odds be ever in your favor ;)). Incidentally, this is also the youngest baby I've ever painted :). Two months of gestation! Venir en France avec moi! Come to France with me! I have to trust Google Translate for the French portion of the title, so please forgive me if it doesn't sound completely French :) Now, what it's all about. A few weeks ago, a lady contacted me asking about the watercolor batik process that I used to make my French Windows painting. She was intrigued by the end result and, of course, by the labor-intensive process. So much so that she asked me if I would fancy running a workshop teaching this technique. In France! It turns out that she organizes and runs "painting holidays" at her part 12th-century monastery, part 18th-century farmhouse home in Bandouille, France. I would very much like to run a painting holiday! As a matter of fact, I will learn French for this opportunity :) Now, if I can only find people to come and spend their vacation in France while taking a workshop from me, we're good to go! Check out France Painting Holiday and let me know if it's something you would like to do. Meanwhile, I want to create some videos on the watercolor batik technique to get you even more excited ;). I think a Yupo workshop would be fun, too. Do you like learning new things in a warm and friendly atmosphere? 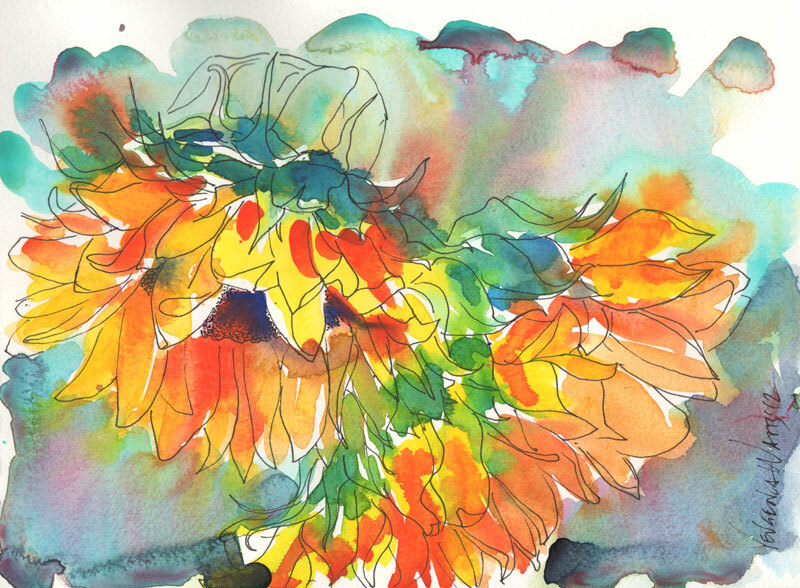 Have you always wanted to try watercolor painting but heard that watercolor is hard? Come and have fun! My classes are for beginner to intermediate painters and include step-by-step introduction to painting with watercolor. You will learn all about the tools and materials for watercolor painting, different ways to apply paint, and will make a few paintings of your own! Bring a friend to make it even more fun! Cost: $99 (for a limited time). For a suggested supplies list, click here. A basic supply kit will be available for purchase at the first day of class for $35. Save 10% when you register on my website. Enter discount code SilverLakes at checkout. Senior Discount! Email me or call (916)749-6066 for details. My artwork is now on checks! 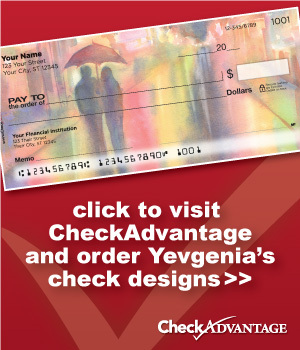 In early December last year, I was approached by a check printing company, CheckAdvantage, to see if I was interested in creating several sets of checks with my artwork on them (shout-out to Skinny Artist, I was found through their artist directory!). So I said, sure, and last week, we launched my CheckAdvantage products. I am tempted to buy my own address labels and checks :) (good sign, right?). There are nine themed sets with four images each, featuring my favorite artworks. Seascapes, cityscapes, flowers, trees, California, Europe, and even a separate set of sunflowers :). I'm pretty excited about all this. I always look for something artistic and, preferably, unique when I order checks and I love writing a check and thinking of the person receiving it and how they would say, "Oh, this is a very cool check! She has a great taste." Or something like that :). I can't wait to run out of my current boring checks! Whatever winter holidays you celebrate, I wish you happy and merry ones! It has been a good year for me, both personally and professionally. Thank you for your interest, support, and encouragement! They mean a lot to me. As a small gift, please treat yourself to a desktop wallpaper with the image above. It's the new version of an older painting of San Bernardino mountains. To download the wallpaper, click on the image, then right-click and choose "Save Image as" or "Set as desktop background" (or something along those lines, according to your operating system). Enjoy! Solo show opening this Saturday! Remember "A Portrait A Day"? No? Well, it's been a while. It was a project I did in 2010-2011. I decided that I would paint a small portrait (most of them are 9x12") every day and limit myself to 30-60 minutes per painting. This upcoming show highlights the best of the 60+ paintings that I completed. It is my first solo show at a gallery, and definitely the first one of such a large scale. I would love to see you at the reception! If you are interested in submitting your art for the Featured Artist of the Month, check out this Facebook page.